Life is full of interesting little questions, questions of no consequence that lead to bigger things. Like, why is the finale of Gioachino Rossini’s William Tell Overture used as the theme for The Lone Ranger? Admit it, when you hear that tune — ditty bump, ditty bump, ditty bump-bump-bump — you hear the hearty hi-yo Silver. Even kids, who know the masked man only from cable TV reruns, know about him and his faithful Indian companion, Tonto. But what does all that have to do with a Bel Canto grand opera about the freedom of the Swiss from the oppression of the Austrian Empire? 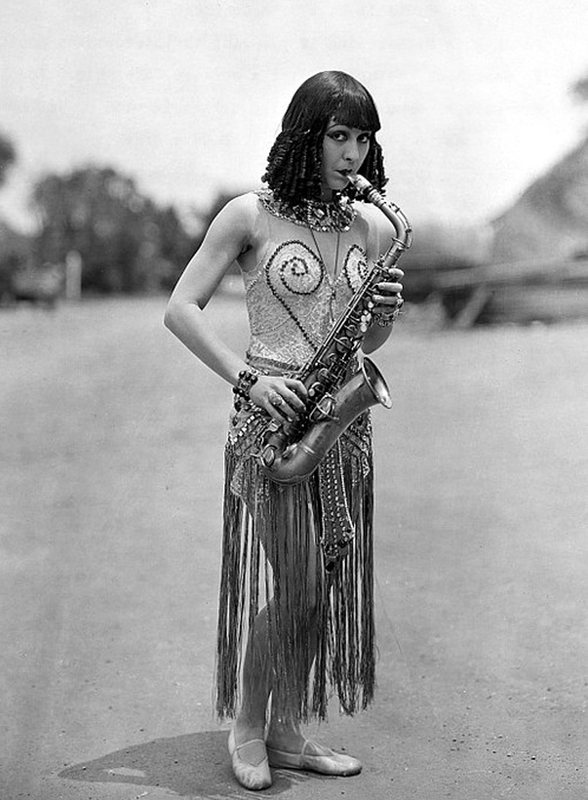 To understand, you must go back to the era of silent movies. Although they are always called silent, in fact, they never were. From the very first public showing of the new motion picture, in Paris in 1895, the images have been accompanied with music. You can as easily imagine a ballet without music as a Chaplin short or a D.W. Griffith epic. And in fact, movie studios gave more consideration to the music than is generally known nowadays. From the time of Griffith’s Birth of a Nation, many studios provided full scores for their “A” pictures. Nation opened in New York to the strains of a 70-piece symphony orchestra playing the music written by Griffith himself, in collaboration with composer Joseph Carl Briel. It freely borrowed bits of Tchaikovsky and Verdi, mixing them with strains of Dixie and the Star Spangled Banner. The first full score for a silent film was Camille Saint-Saens’ 1908 score for the French film, The Assassination of the Duke of Guise. 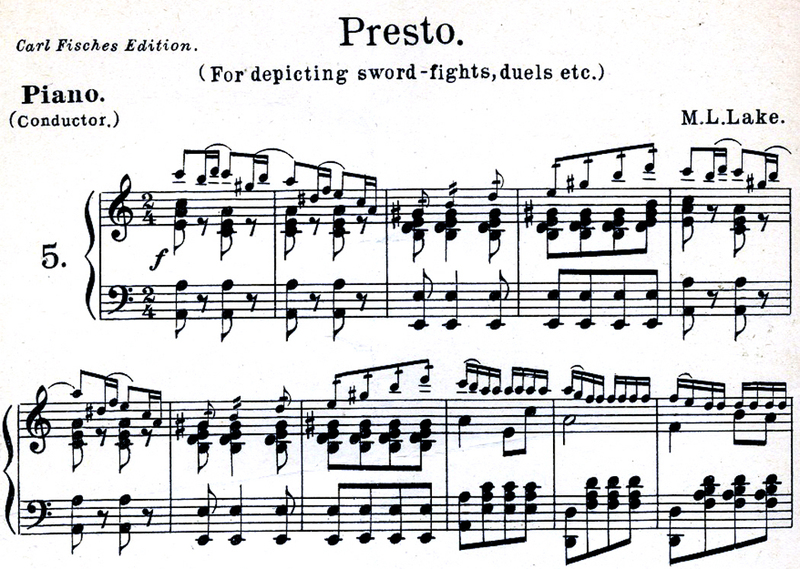 The composer recast the music later for concert performance as his Concerto for Strings, Piano and Harmonium, op. 128. Such scores were not uncommon. Arthur Honegger wrote the score for Abel Gance’s groundbreaking Napoleon in 1927; Darius Milhaud did the same for Marcel l’Herbier’s L’Inhumaine. And Dimitri Shostakovich made a good living writing films scores, when he wasn’t picking up a few extra dollars playing piano for the low-end movie houses. 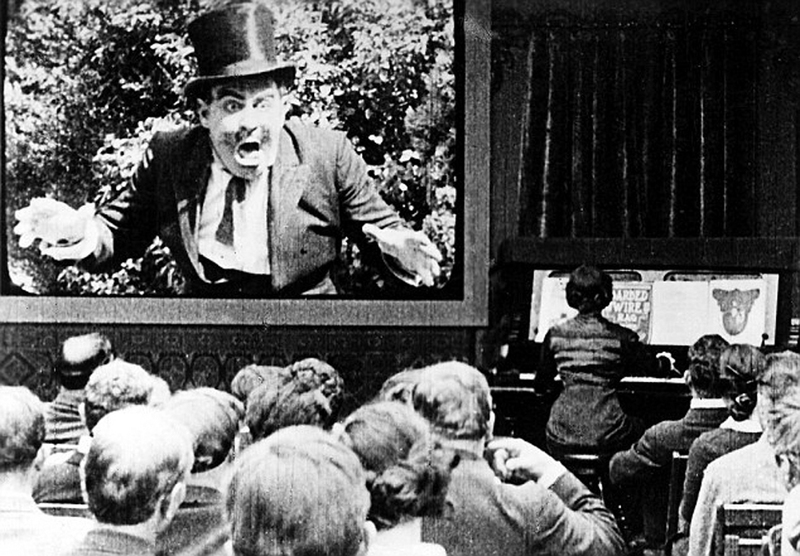 The full scores survive that Charlie Chaplin wrote for his late silent features, City Lights and Modern Times, made after the sound invasion, and now permanently attached to their otherwise silent action. The problem was that not every film was Birth of a Nation, and not every movie house could afford an orchestra. A full score might be fine for New York City, but when the movie went to Dubuque, a cheaper alternative was needed. So, most Roxies and Paramounts across the nation relied on pianists and organists. For an “A” picture, they might rely on piano reductions of the full score, provided by the studios, printed on cheap paper and distributed with the films along with such other promotional material as posters and blocks for newspaper ads. But for a “B” picture, the pianist either improvised on the spot, or relied on one of several “cheat” books. 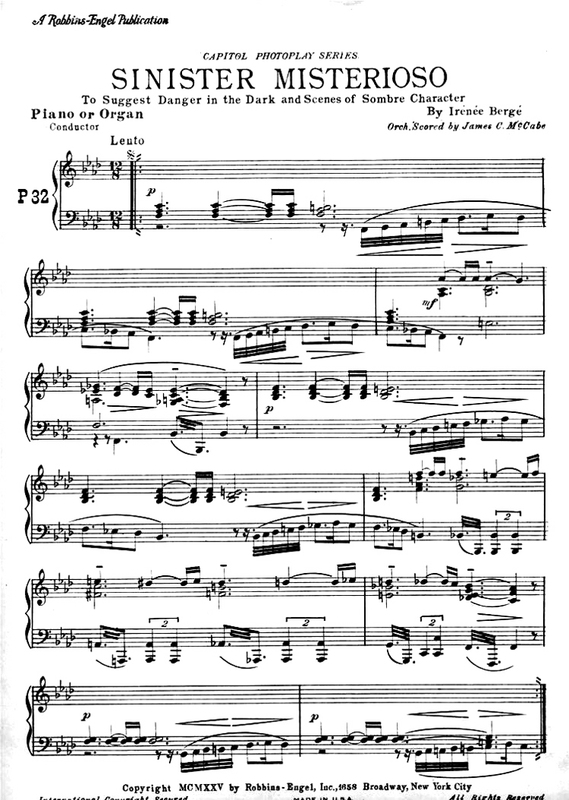 In 1919, Giuseppe Becce published his Kinobibliotek, which was a volume of musical chunks each matched to an emotion or action likely to be encountered in a film. One might be titled, Pursuit, and another, Tender Agitato. Universal Studio came up with its own, assembled by Max Winkler, who borrowed freely from classical music, excising snippets of Beethoven or Bizet to be played by the house pianist at the appropriate moment in the film. Winkler actually made up lists of tunes for each film Universal released, matched to the cues in the plot. “J.S. Bach’s immortal chorales became Adagio Lamentoso for sad scenes,” Winkler wrote. Beethoven provided a “Sinister Misterioso” and Tchaikovsky a “Strange Moderato.” Mendelssohn’s familiar Wedding March was used for weddings. The classical music had two advantages. First, it was readily identifiable. Everyone knew the Wedding March, for instance, so it could be used to make a point. And it was cheap; it was public domain and no copyright fees applied. 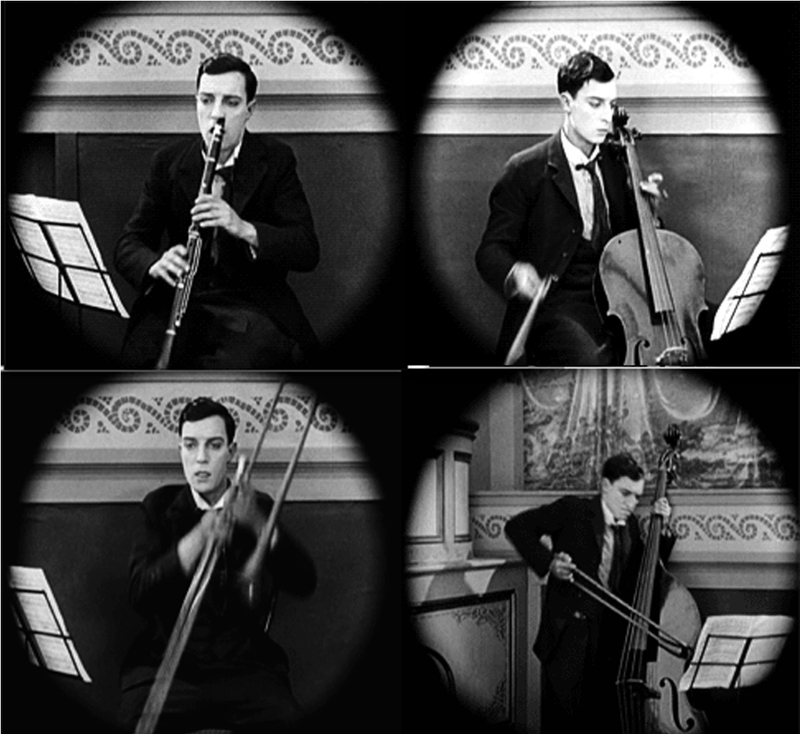 When sound films took over, some of these silent habits persisted. In Hollywood’s Golden Age, film scores still sounded like classical music. The great film composers — Korngold, Waxman, Herrman — were classical composers. And even to this day, when a director wants to add class or underline a scene dramatically, he will likely choose classical extracts. So, Samuel Barber’s Adagio for Strings adds emotional heft to Oliver Stone’s Platoon, and Richard Strauss’s Thus Spake Zarathustra adds portentousness to Stanley Kubrick’s 2001: A Space Odyssey. It also persisted in the sound era in “B” movie scoring, those undercard films on the double feature. You can hear many a familiar melody in the low-budget films. Every Hopalong Cassidy film, for instance, came to a climax with a chase scene underlined with Gluck’s Dance of the Furies. You could count on it. It was an odd marriage of high art with popular culture. And, or course, it provided us with “those thrilling days of yesteryear” and the Rossini trumpet fanfares that summoned us all first to the radio, then to the TV screen.